pH+ Are thrilled to be involved with the London Festival of Architecture. Our installation will run from the 18th June – 03rd July. Join pH+ Architects on the 25th June for our Family Fun Day @ ‘The Milkshake Tree’ in collaboration with the London Centre for Children with Cerebral Palsy. In conjunction with the ‘Empathy Museum’ at the NOW Gallery, Greenwich Peninsula, we are showcasing an experiential installation that stimulates and encourages play through sounds, smells, movement and reflections. ‘The Milkshake Tree’ has allowed us to play and explore some of the elements of the design for our specialist school project whilst creating a space for the public to enjoy at the Festival. Afterwards, the installation will be taken to the Centre’s playground to be reinstalled as play equipment. Bring a picnic and enjoy the installation. You’ll be able to try out the xylophone walkway and sensory garden. Plus lots more to see and do. It’s a great opportunity to learn more about our project and have a great day out. 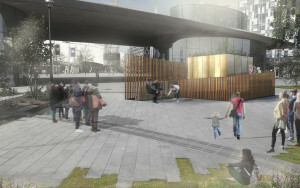 The installation is joint venture with Greenwich Peninsula, BD Landscape Architects, construction company City Sq, and Creative Aluminium Solutions.